One of the products lines that caught my eye this past week at Toy Fair 2013 was a NERF set designed exclusively for tween girls called REBELLE. 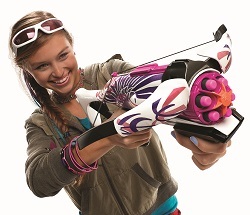 This pink crossbow and set of accessories clearly capitalizes on the popularity created by Katniss, the heroine from last year’s blockbuster hit The Hunger Games. Designed to empower young girls with a sense of adventure, while incorporating a feminine flair and social elements, the Rebelle line will incorporate several different weapons, mission kits and apps to round out the experience. Three crossbows will be available for sale including the Heartbreaker Bow, Crossbow and Pink Crush Mini Crossbow. Pull back the bow string handle to hit targets up to 75 feet away. The bows will all retail from between $9.99 and $24.99. Of course you can’t have a pink and purple bow without accessories, so you can buy a Mission Kit for $19.99 that will include a blaster, extra darts and a hip holster. You can also buy a pair of blasters separately for $12.99. And if your tween feels the need to look stylish while doing all of this, Rebelle Vision Gear eyewear will also be available for sale, retailing for $6.99. One of the coolest aspects of the Rebelle line is the Mission Central App. Similar to the Lazer Tag guns released last year, you download the app to your iPhone or iPod touch, place your device in the cradle accessory and prepare to do battle. You can create avatars, earn virtual accessories and capture photos and videos while playing the game with your friends. The app will retail for $14.99.